Eve Harrington (Anne Baxter, The Razord’s Edge), the self-proclaimed #1 fan of theater legend Margo Channing (Bette Davis), ingratiates herself into the famous and temperamental thespian’s inner circle of friends and colleagues. However, unbeknownst to most of them, Margo included, Eve has an agenda of her own: the young woman would do anything, I mean anything, to become as famous as her idol. One of those films that don’t need an introduction. 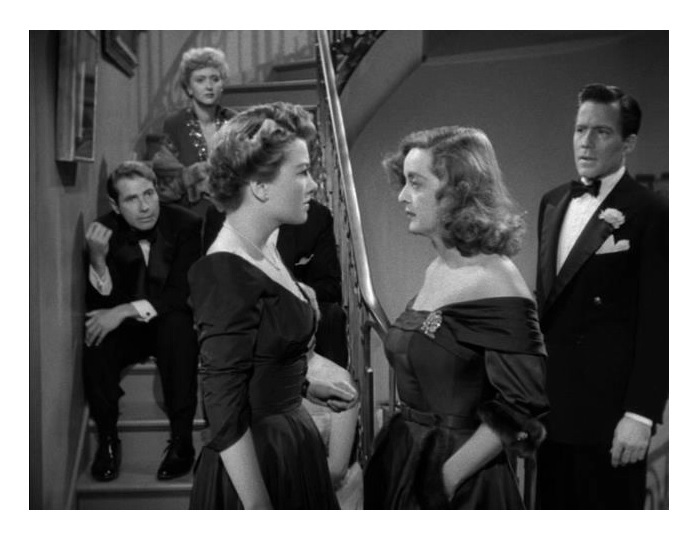 Joseph L. Mankiewicz’s All About Eve is simply put an American classic. The film, in my humble opinion, contains the best screenplay ever written in Hollywood. The cast is extraordinary too. There isn’t a single false note in the entire movie — this is as perfect as cinema can be. I just love Makewicz’s (A Letter to Three Wives and The Barefoot Contessa) witty, intelligent script. The narrative, which is loosely based on Mary Orr’s Cosmopolitan Magazine short story (Orr’s story was inspired by the real-life relationship between German Actress Elisabeth Bergner and her assistant), is brilliantly constructed. The script also has more quotable lines per minute than any other film in history. Of course, no one, not even the literate people of the theater, talks like that. But the actors make all those lines sound natural, believable. More important, All About Eve demonstrates that in a predominantly visual medium like cinema dialogue can be a force to be reckoned with. Scenes are staged without much glitter — you barely notice the camera work — and the emphasis is on character development. And each character has a specific function in the movie, which is why I think the movie never ceases to be interesting, engaging, and entertaining. Finally, the film has a top-notch cast, right down to the smallest roles. It’s now hard to believe that most of the actors were second/third choices. Anne Baxter does a diabolically good job in the title character. George Sanders’s (The Picture of Dorian Gray) cynical critic Addison DeWitt (“I am a critic – as essential to the theater as ants to a picnic”) is one of cinema’s most memorable villains. Gary Merrill (Twelve O’Clock High) has great chemistry with Davis. Celeste Holm (Gentleman’s Agreement) adds a touch of class to the film as Margo’s best friend. Even a lightweight like Hugh Marlowe (The Day the Earth Stood Still) delivers the goods as playwright Lloyd Richards. Towering over all of them is Bette Davis. She always claimed that she and Margo Channing had very little in common, but I’m not sure that’s entirely true. Maybe she’s right, I don’t know, but Margo is exactly how I perceived Davis to be in real life. Anyhow, Davis does a superb job letting you see the human side of a larger-than-life theater personality. Even when she behaves badly (“infants behave the way I do, you know – they carry on and misbehave – they’d get drunk if they knew how”), you are always in Margo’s corner. Alfred Newman’s (How the West Was Won and Airport) spirited music score and Edith Head’s (Sunset Boulevard and To Catch a Thief) memorable gowns are two more things in the movie that deserve praise. 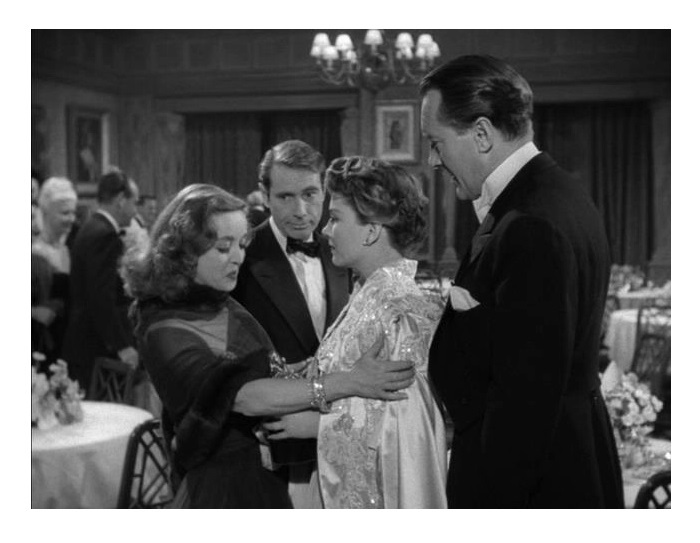 As I said before, All About Eve has many great lines (my personal favorite is: “I’ll admit I may have seen better days, but I’m still not to be had for the price of a cocktail, like a salted peanut”), fantastic acting, and excellent production values. It’s one of those movies I never get tired of watching. It has a powerful, memorable ending — in one short, dialogueless scene Mankiewicz summarizes what this film is all about. 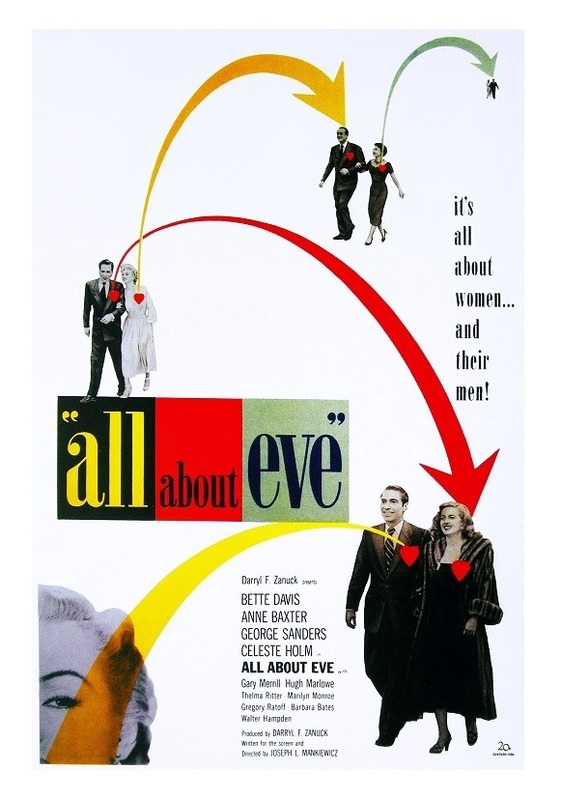 All About Eve easily stands with the greatest films in history. B&W, 138 minutes, Not Rated. I really must see it, so many well known lines from it. I like what you said about not noticing the camerawork and that every character has a purpose. I’d never thought about that before, but you’re right. I, too, am a little miffed that Thelma Ritter’s character doesn’t have more screen time. She’s fabulous, for pete sake! Thank you for this fine article, Eric. There are two or three other roles that l loved watching Bette perform, more than Margo Channing…but I have to concede that this is her best film ever. I. Love.This. Movie. I was lucky enough to first see it on the big screen in a local theater that featured classic films once a month. I’d heard of the movie, but had no idea what the storyline was — it took me a little while to recognize what Eve was all about. Okay, I was 19, and maybe today I’d pick it up a lot earlier. Anyway, while I’d always enjoyed classic films, this one got me hooked. 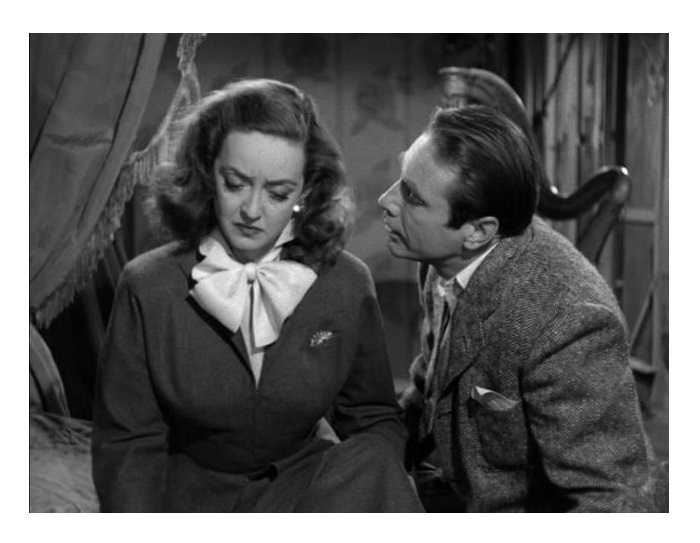 I just wish Bette Davis had won the Oscar for her performance. Nothing against Judy Holliday — she did a wonderful job in ‘Born Yesterday’ — but like many people, I believe Davis lost because Anne Baxter insisted on being in the same category. That split vote cost her. I simply adore this movie. A scintillating script and fine acting makes it a classic. Agreed. A bona fide classic! Thanks for stopping by! It’s one of my favourite movies. I love quoting it.